January was the best opening month for the stock market since 1987. I doubt we will see a repeat of Black Monday with the DJIA off 22.6% in a day, but there are still many potential negative catalysts in the market: debt build up, slowing growth globally, growing political populism & nationalism, trade imbalances across Europe creating ongoing issues, and the trade war between the US and China. The market may have over-read the Fed’s willingness to hike into a deteriorating market as they lifted rates on December 19th & Jerome Powell stated rates were a long way from neutral on October 3rd of last year. The market might now also be over-reading into Federal Reserve dovishness. The end of last year was so choppy because there were both tax loss harvesting driving down the price of losing positions & some winners were sold to lock in profits while offsetting tax loss harvesting. Combine those with fear of a hawkish Fed & there were many people with an incentive to sell & algorithmic players riding along to cause heavy moves in a time of year that traditionally has light volume. We’re at the point where many people who traded on the (incorrect) thinking the Fed would be dovish on the 19th of December now see many of those positions back in the black. I sold out the bigger stake I had in Apple (still have a smaller stake from long ago), the ExxonMobil position I had, the remaining AbbVie I had, etc. I also dead cat bounce traded Verizon & AT&T on their sour earnings reports, along with Paypal’s fall after reporting earnings. A few days back Funko was off over 8%, so I traded a bit of that & sold it when they were back to off 4%. Verizon wrote down $4.6 billion – about half the purchase price of Yahoo! & AOL (formerly known as Oath, known as Verizon Media Group after Tim Armstrong left the company). Yahoo! Finance finally launched their subscription offering with a free trial & a $49 monthly recurring fee. Many traditional newspaper chains & upstart online publishers like Buzzfeed & Vice have done rounds of layoffs, so it remains to be seen if Yahoo! Finance has enough pull to be worthy of a monthly subscription years after they shifted from offering lots of original content to mostly referring traffic to third party sites with original news coverage. One thing Yahoo! has going for them is Google gutted Google Finance over a year ago. One problem with a market that keeps going up is it can allow a speculator to presume they are brilliant because they keep winning on every trade. In a market with bullish sentiment even bad news only temporarily clips stock prices. After a healthy run in the markets I prefer to have lower exposure so I don’t have big positions caught offsides if any of the big issues crop up & cause dislocations: hard Brexit, Italian politics in Europe, the yellow jackets in France, the tsunami of bad debts in China, trade war stuff, etc. … I’d rather wait for company specific, sector specific or marketwide slides before deploying much capital. Housing has many headwinds: the TCJA capping SALT deductions, affordability (particularly in a rising rate environment), lower investment from Chinese investors, slowing economic growth, still rapidly rising healthcare costs ramping local property tax payments, uncertainty with potential policy changes toward Fannie Mae & Freddie Mac, etc. Weyerhaeuser (WY), a timber REIT, was down to $25 a share in pre-market after missing their numbers top & bottom line, during the day they reversed & closed at $26.75, up 1.94% on the day – about a 6% swing from the bottom. They were one of the biggest dogs in last year’s decline, but they’re up over 30% off their lows. They are one of a few large REITs which is not near or at 52-week highs. 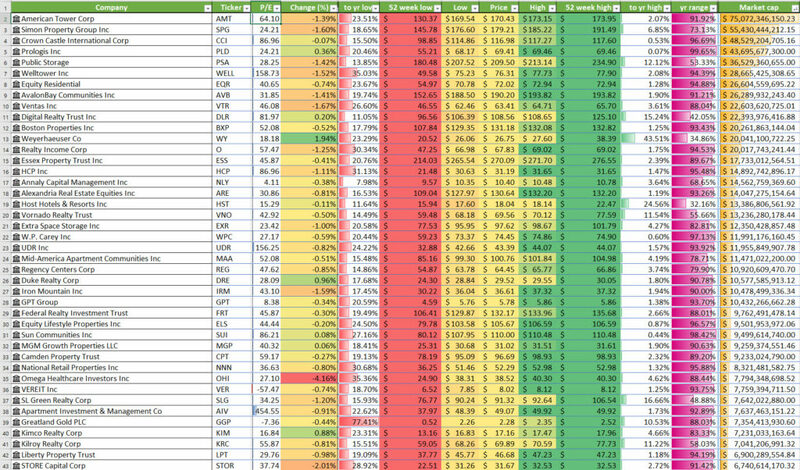 From the following table you can see in the column one from the right how most of the REITs are within the top 10% of the range they have traded over the past 52-weeks & the column left of it shows most are within 2% to 3% of their 52-week highs. I bought tiny positions in VLO & TGT today. Both were down significantly on the day. VLO has recovered quite a bit since the Christmas eve bottom in the stock market, but they’ve also seen insider buying & they’ve beat expectations by a wide margin. As long as diesel margins remain high — and there’s little reason to see them falling, given low inventories — then refiners can live with weakness in gasoline. Valero, in particular, has demonstrated its ability to capture opportunities on margins where it can find them, and pay out any windfalls to shareholders. Conversely, such financial strength means gasoline supply could stay strong as the year progresses. Tons of retail stocks slid in tandem with Amazon.com after Amazon.com gave soft forward guidance, but some of the issues Amazon is facing like mounting regulatory pressures in India are not being felt by purely domestic US retailers. Amazon facing headwinds in an emerging market likely increases the value of retailers with a heavy United States emphasis, because the US-based retailer does not need to jump through hoops to undo those malinvestments & they can focus on improving their core business, while the multinational has to give more thought to how they are fueling international growth & if it makes as much sense to cross-subsidize into emerging markets where any success will likely be met with a row of nails thrown under their tires. And that growth just went oops. Google also looks to be cleaning up in India as they own Android & the iPhone is not a big seller in India. Mobile usage indexes way higher in India than in many other countries. In addition, Google hasn’t got hosed on massive investments the way Amazon & Walmart just did, while smartly acquiring tuck in companies like Where is My Train relatively cheaply, and avoiding the type of scorn Facebook’s WhatsApp has earned. Target is only worth a little more than double what Walmart paid for Flipkart. Relative to the market caps of the big tech monopolies both Target & Kroger would be cheap buys if the other big tech players wanted to compete head on with Amazon.com. As Amazon.com becomes an ad farm Google spending less than half of their cash on hand to buy out the largest grocery chain & the biggest broad-based US retailer not named Walmart would be a smart strategy to ensure their conversion process is as smooth as possible & they take the fight to Amazon rather than watching Amazon keep encroaching on their turf.